An iPhone X emulates Mac OS 8 very well, including running Warcraft II and Sim City 2000. Because phones are small, it’s easy to underestimate how powerful they are. Give an iPhone a larger display and it would make a fine desktop PC. 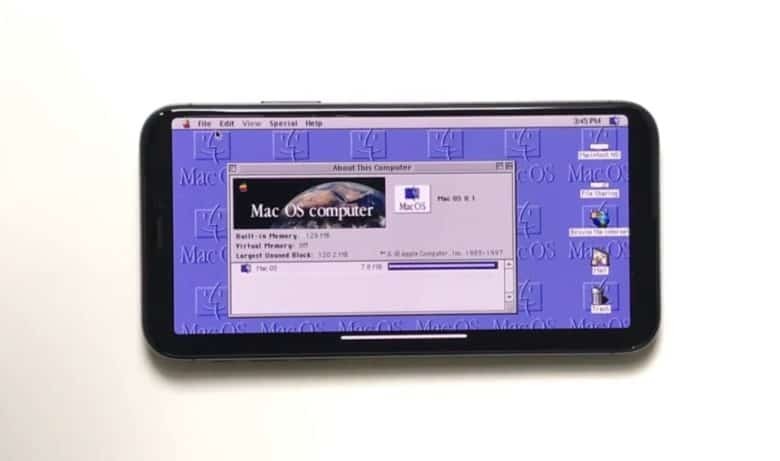 Case in point: A new video shows an iPhone X running Mac OS 8.1 as well as a couple of games. Admittedly, Mac OS 8.1 is hardly a modern operating system. (Apple introduced it in 1998.) And some might not be impressed that an iPhone can run an OS designed for 40 MHz processors. And the iPhone does it very well. Mac OS boots up a bit slowly, but that was typical for real Macintosh computers back then. And after that, performance of the emulated device is quite good. Note: The video has no sound. To be clear, this isn’t being suggested as anything practical. It’s someone’s hobby project. Even if there was a real need for a 20-year-old operating system, the screen is too small for most drop-down menus. That said, the video also shows Hacking Jules’ emulator running on an iPad. The larger screen of the tablet could make this a way to play classic Mac games for which there’s no modern version. The software appears to be a port of Basilisk II, which can emulate a Mac with a 680×0 processor. It can handle up to Mac OS 8.1, as Apple switched to PowerPC processors after that. This isn’t going to be available for most people to download. Apple specifically forbids emulators in the App Store. It’s possible Hacking Jules could release it for jailbreakers, though.